Monthly Newsletter - A complementary subscription to the Chamber’s monthly newsletter is included in your annual dues. Rugby Bucks - Rugby Bucks may be purchased by anyone, but only redeemed at chamber member stores. They are purchased and exchanged for the face value. This is an excellent way to promote and keep the money in Rugby. Membership Plaque - A display plaque is another no cost benefit of your Chamber of Commerce membership. Internet Services & Web Site Exposure - Your membership provides you with automatic listing on the Chamber Web page, along with a link to your web site. You can update your own profile listing and post employment opportunities for your business. Leadership Opportunity - You can join a Chamber committee to further participate in the advancement of your business and community. Chamber Events - The Rugby Chamber of Commerce sponsors the following annual event: The Parade of Lights, Christmas Promotion, Farmer/Rancher Appreciation Night and Ag Expo, Business and Family Picnic, 4th of July Parade, Annual Softball Tourney, Geographical Center Day and several other retail promotions and community events. Business Workshops and Seminars - Chamber members will be invited to attend seminars and workshop designed to enhance the business. After Hours Business Mixers - This gives the business owners and employees a chance to socialize away from the office. If you do business in Rugby . . . you are probably dependent upon the growth and prosperity of Rugby to make your business more profitable. The Chamber is the organization dealing with the concerns in Rugby and working for continued growth in the community. If you are a small business . . . you realize the importance of making business contacts in the community. A majority of Chamber members are small businesses. By working together through the Chamber, they bring more businesses, more residents, more tourists, and more customers to Rugby. If you are too busy to be involved . . . you can benefit from the efforts of the Chamber to promote and insure the growth of the community. Even if your budget is tight . . . you will find Chamber membership will provide you with a high return on your investment. 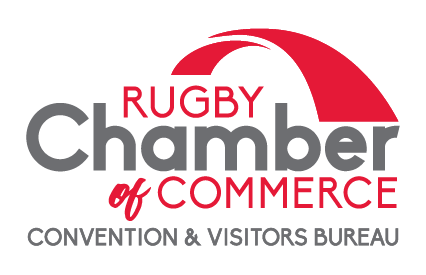 Membership in the Rugby Chamber of Commerce means exposure, referrals, and assistance in your business. Community Development . . . the economic development of Rugby is one of the main concerns of the City and Chamber; we hope to facilitate growth of existing companies and new businesses.